My attitude towards developing in new languages/environment has always been: you’ve seen one, you’ve seen them all. All I require is a brief documentation of the new environment, a sample code or two and 15 uninterrupted minutes. Oh yeah – and a mission. A good idea motivates you to learn the practical aspects of the new language, and forces you to merge your experience and existing skill set with the new tools you learn. I learned the hard way that if I can’t find something interesting to develop, my interest tapers off and I leave the new toy untouched. I’ve been testing the Google Chrome web browser ever since it came out. While it was quite faster than FF (not to mention IE), I never completely switched to it, mostly due to the lack of extensions support. I’ve gotten used to the AdBlock Plus extension in FF, which allowed me to not see a single ad on any web site for the last 3 years (so much so, that for the brief time I had Google Ads on this site, I had to add my site to the exceptions list). But since Google lives of those ads, I was sure hell would freeze over and pigs become kosher before Google will support those extensions. Wrong. The latest Dev releases of Chrome (version 4.0.213 and higher) started supporting simple extensions. I couldn’t wait to develop my first one. But I needed a theme – something my extension will do. Introducing the Traveling Tech Guy RSS Marquee extension. This little extension lives in your Chrome’s status bar, and scrolls the last 10 posts from this blog. Clicking a link takes you to the post. Hovering over a link shows the first 2-3 sentences from the post (thanks to Yaniv for the suggestion), clicking the icon collapses or expands the marquee, allowing you to save precious space in the status bar. Get the latest version of Chrome (v 4.0.220 and higher) from FileHippo, and install it (takes less than a minute). [For advanced users: by default, Chrome only updates to release versions – v 2.*. You can subscribe to the Dev channel, or use the Google Chrome Channel Changer so your Chrome updates automatically to the Dev trunk 4.*]. 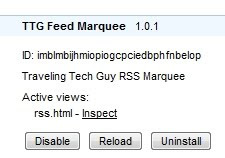 Browse to the Traveling Tech Guy RSS Marquee extension, click “save” and then “install”. Clicking it again will collapse it. 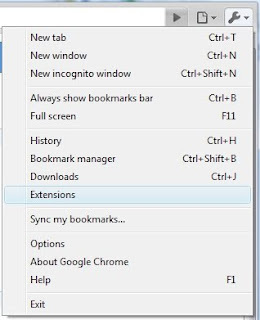 or type “chrome://extensions/” in the address bar. In the future, I hope to add more features to this extension, such as the ability to specify a different RSS feed, theme support, preferences support – who knows? I’m open to suggestions. I also started working on an FF version for this – stay tuned. Funny enough, the challenge wasn’t developing the extension, but hosting it. My server uses IIS7 and plain out refused to serve a file with the CRX extension. After a couple of days of back and forth with my hosting provider, I ended up adding the extension’s mime type to my site’s web.config file – and that did the trick. Oh, and last piece of good news: hell may still be hot and pigs are definitely not kosher, but there’s an AdBlock+ extension for Chrome now (not working as well as FF’s, but getting there) - so Chrome is back on my menu. And if you need an extension or a web applet developed for your site/product/company - you now know who to ask .